Recently I saw a post on Reclaiming your Castle for baked zucchini. Her post struck a cord with me because when I was 18 years old living in my first apartment and not knowing much about cooking, I would go to the market and bring home random vegetables not knowing what in the world I was going to do with them. I knew I couldn’t go wrong with zucchini. As a little girl I loved zucchini. I remember walking through my dad’s garden and selecting one zucchini and asking my mom to cook it for me. Kindly and patiently she sliced it into rounds, boiled and put a pat of butter on it. I sat at the dining room table all alone enjoying my little bowl of comfort. There was a time when boiling vegetables (a little too much) was the default recipe for getting them on the table for a houseful of hungry folks. Therefore, at 18 years old when I discovered a breaded and baked zucchini recipe I was intrigued and knew it was going to be the first vegetable I wanted to learn to cook, rather than boil. And I remember cooking it over and over again. I used an egg dip, seasoned italian bread crumbs and dotted each one of them with butter before baking in a preheated 425° oven for approximately 25 minutes until nice and crispy. Revisiting this recipe after two decades (or so!) was like walking back into that little apartment kitchen. This is a great side dish for the little ones around your table. Please visit Sara’s site for a more detailed recipe! What really made these delicious was the caramelized onion dip. I followed Sara’s recipe with one minor change. I used greek yogurt rather than mayonnaise. Don’t get me wrong, I love mayonnaise. I didn’t have enough in house and I happened to have a full tub of yogurt. Honestly, this is the same recipe I make for our potato chips while we are watching games during football season. Melt the butter in a non stick pan over moderate heat. Add the sweet onion slices and cook stirring occasionally until the onion softens and caramelizes. This should take between 20 and 25 minutes, on medium-low heat. When the onions are a nice brown hue and caramelized remove from heat and cool. Place the onions, vinegar, honey and mustard in a food processor or blender and process until smooth. Place in a serving bowl and stir in the yogurt. 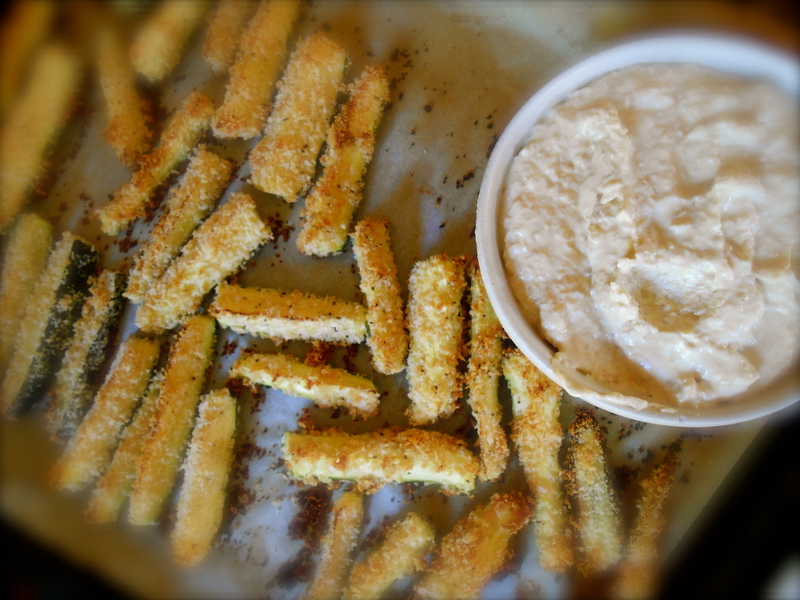 Both the baked zucchini and the caramelized onion dip sound amazing! I’ve never baked zucchini, but I love caramelized onions… and this sounds like something I could use very very soon! :) Bon Appetit! Happy weekend my dear! Thank you! And have a fine weekend! Hi Christina. Thanks so much! This was one of those “unimpressive” posts! I wanted to “chronicle” the recipe into my recipe page! Thank you for your comment! :) Also..did I read somewhere on your blog you live in Seattle? Oh love this, the dip sounds amazing. I love zucchini too!!! Great as a snack or with a meal. Great way to cook zucchini, yum! Both recipes sound wonderful and though I, too, like mayo, I think I’d prefer the dip be made with yogurt. I guess the only way to know for sure it to make it. Thanks for sharing both recipes. I agree. I have developed a taste for yogurt (in place of mayonnaise) in my dips and sauces. I used to favor mayo, now it seem too rich and oily for my palette. Great, just in time for Father’s Day. Thanks for sharing! This version of bake zucchini is new to me. I would love to try it. HI Danny! You may really enjoy it. It is vey easy to prepare. I used panko bread crumbs. I put some bread crumbs in a small paper bag and after dipping several zucchini sticks in egg I just shook them in the panko to coat. Very simple and very good too! Crispy zucchini bites… Oh, yeah! And the caramelized onion dip, I’ll eat anything with caramelized onions! Bet this dip is amazing with potato chips! this could be better than French fries – looks yum yum yum! Another mouth-watering crispy baked vegetable! I made your caramelized parsnips twice. My first time to eat parsnips, can you imagine? Never knew how to cook it before or never even tried. The second time, I shredded them like thin french fries before I caramelized-baked them and mixed the crispy sweet strips with my green salad. Yum! Thanks for the inspiration. I will try the zucchini with the yogurt dip as well! But on another note – I cannot understand why your posts are not showing up in my reader. I found this by fluke. There seem to be some recent WordPress bugs – and I wonder if I am alone – or if anyone else is experiencing glitches? I’m pleased to have received this post in my email….My husband & I are zuchini lovers……so much so we have planted several zuchini plants. I will definitely be trying this recipe. This onion dip sounds fabulous as well! Thank you so much for stopping by! I just visited your very nice blog. Your cakes are awesome! Looks delicious! I love zucchini and this is a great way of eating it. YUM! OK, I’m inviting some friends over so we can sit around and much these yummy things! thanks for the recipe! You are currently reading baked zucchini and caramelized onion dip at COTTAGE GROVE HOUSE.